Everything was perfect. 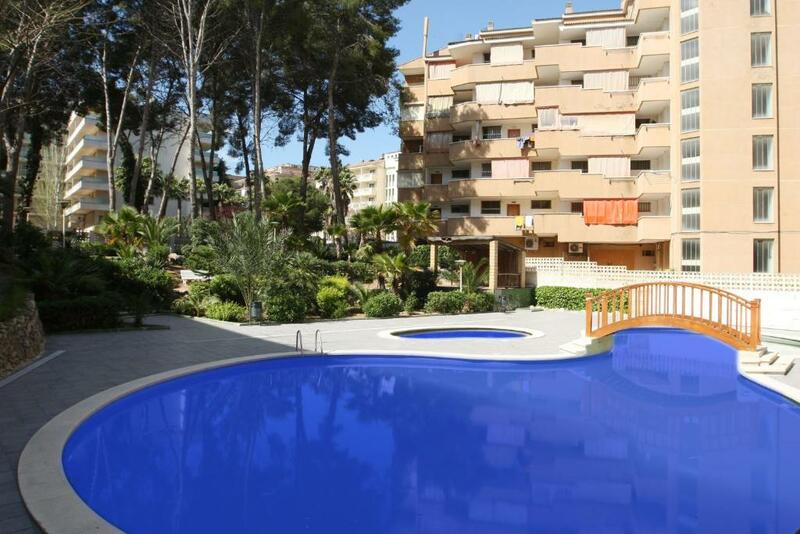 The apartment is situated in the heart of Salou with a lot of bars and restaurants nearby. Very clean and well equipped. I found everything I need in the kitchen. 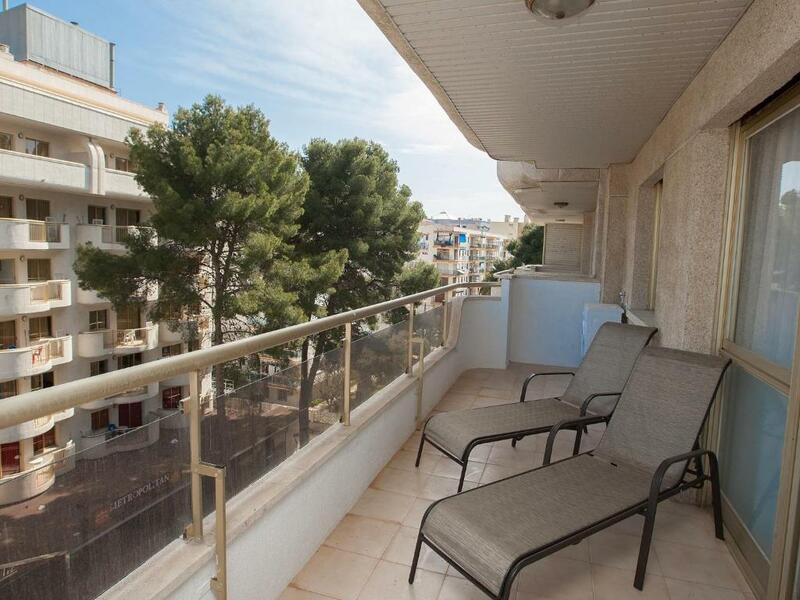 The apartment is a few meters close to bus station to portaventura and other destinations. Very good internet connections all the time. I liked the interior of the apartment, inc the decor and furniture. Click and booking were also an excellent company to deal with. 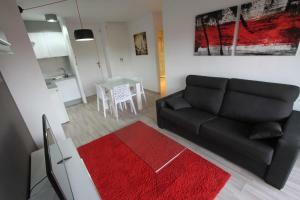 Zona de pozitionare a apartamentului este aproximativ langa plaja, in apropiere boutiques, minimarket, fff multe restaurante. Informatiile de la receptie si pe site sunt foarte utile si complete, personal super amabil. Locatia dotata cu strictul necesar si toate functionale, ce iti confera confortul de acasa. One of our best sellers in Salou! 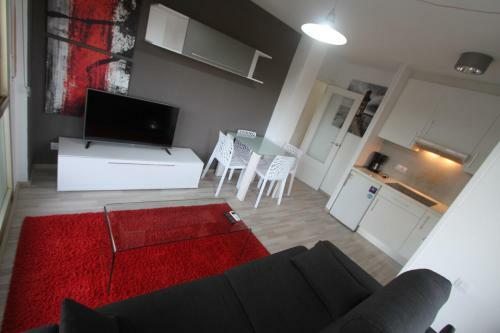 These bright apartments are set 1,300 feet from Llevant Beach and the seafront promenade. They offer a shared outdoor pool and gardens and a private furnished balcony with city and mountain views. 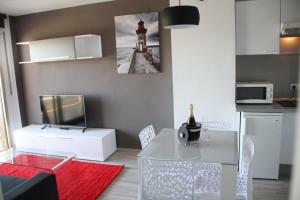 Apartamentos Arquus Center feature attractive décor and traditional furniture. The open-plan lounge-diner has a sofa bed and TV, while the kitchenette includes a washing machine, microwave, hob and toaster. The apartments are set in 4 buildings on the popular Carles Buiges Street, where you will find various bars, restaurants and shops. Salou Marina is 15 minutes’ walk away. 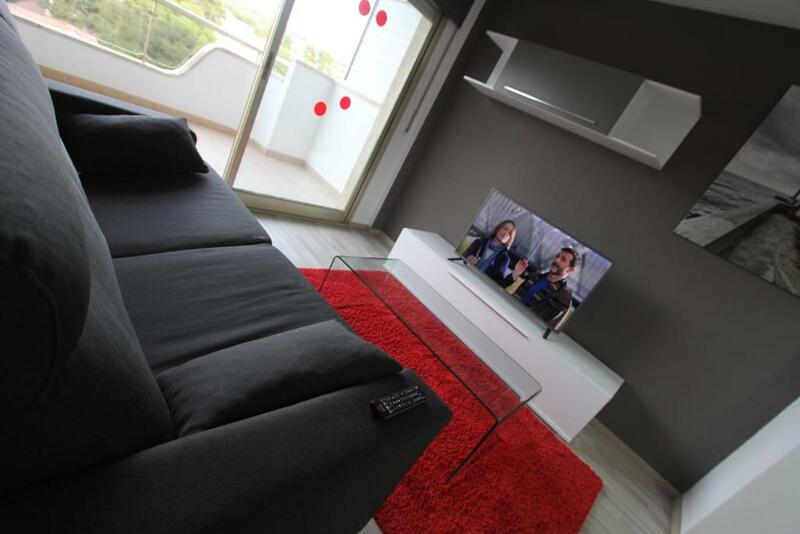 The Arquus apartments have a reading area and are 1.2 mi from cap de Salou and its pretty coves. PortAventura Theme Park is 10 minutes’ drive away. Salou Train Station is 1.2 mi away and Reus Airport is 9.3 mi away. You can drive to Tarragona in 15 minutes. 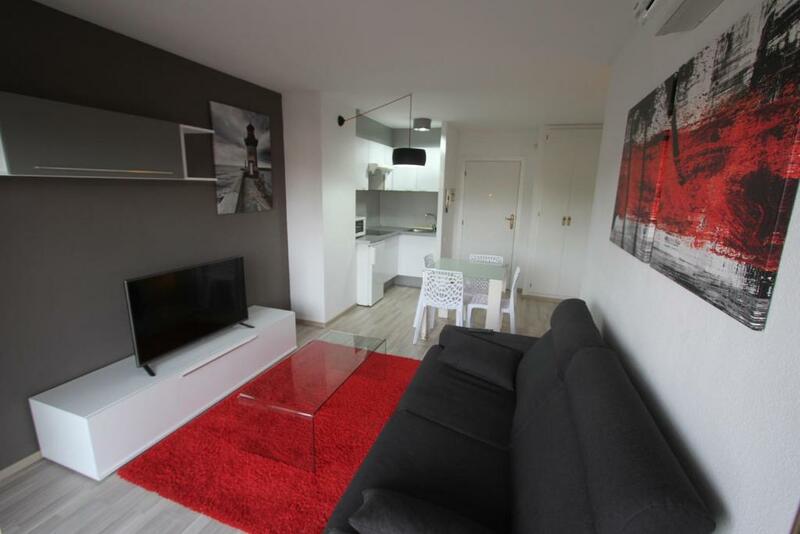 When would you like to stay at Click & Booking Apartamentos Arquus Center? This apartment features a washing machine, seating area and balcony. This apartment features a washing machine, stovetop and toaster. The Arquus Center apartments are located in the tourist area of Salou. In these apartments you can spend a great holiday enjoying its modern decoration and proximity to the best beaches, restaurants and nightclubs in town. Ideal for holidays with friends. House Rules Click & Booking Apartamentos Arquus Center takes special requests – add in the next step! Click &amp; Booking Apartamentos Arquus Center accepts these cards and reserves the right to temporarily hold an amount prior to arrival. Click & Booking Apartamentos Arquus Center accepts these cards and reserves the right to temporarily hold an amount prior to arrival. Please note that on 24 December, 31 December and 5 January check-in is not possible after 15:00. If you expect to arrive outside office opening hours, please inform Apartmentos Arquus Center in advance. You can use the Special Requests Box when booking or contact the property using the contact details found on your booking confirmation. Please note, you must pay a late check-in surcharge of EUR 50 if you arrive after 20:00. Late check-out after 11:00 is available for an extra cost of EUR 40. Please note that the seasonal outdoor pool is open from June 15th to September 15th. Please inform Click & Booking Apartamentos Arquus Center of your expected arrival time in advance. You can use the Special Requests box when booking, or contact the property directly using the contact details in your confirmation. Collecting the keys was too far, no cleaning for 8 days, no clean towels, old building, very poor location and view from the apartment. There wasn’t any information about the 300 € cauction during the booking. There are no loungers at pool, the location is so noisy, and there is zero soundproofing in the apartment. We really struggled to sleep due to the noise from neighbours, traffic, and clubs. Keys were a 30 minute walk away, paid 40 euro's each room (2 rooms booked) for cleaning, we expected them to clean the rooms while we stayed then found out it was to clean them after we had gone. Washing machines in the 2 apartments didn't work and the shower in the one room was cold, no hot water, air con stopped working and a lot of noise from young spanish teenagers, with no security there they could do what they want at 5.30 in the morning, not happy! !